Understanding customers is important to every business, but probably more important to casinos than to any other. In part, this is because understanding customers is critical to creating a great entertainment experience and partly because the world of casinos is a very competitive place and bound to become even more competitive over time. After all, there’s a limit to the gambling dollars in any marketplace, so growth, aside from introducing other forms of entertainment, relies primarily on taking away market share from competitors. Being competitive can’t be accomplished only through your monthly coupon offers or only by promoting an experience. Those efforts are required, but to be truly competitive in a way that sets you apart, you need to understand and engender the kind of emotional loyalty you can’t buy with coupons. That means understanding things about your players that you can’t get from your player database. Understanding players is essential if you want to build relationships. By leveraging your database, it’s possible to survey your players and get almost any kind of information. We can target any group of players that you can identify in your database: high-performing players, slot players, table game players, poker players, those whose play has dropped off, players from any geographic area. And, we can merge player data (ADT, number of visits, type of play, etc.) with survey data, meaning we can look at survey results by player profile. 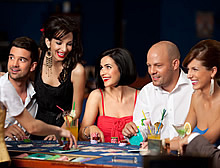 This all-purpose survey asks questions on a broad range of topics; typically asking players to evaluate their experience in every aspect of casino operations: slots, table games, poker, food venues, entertainment, gift shop, customer service, atmosphere, maintenance, etc. The omnibus survey is described in more detail on the Membership Survey Page. Omnibus surveys often include a number of questions about gambling habits and visits to competitive casinos. In addition to demographic questions, the survey often includes lifestyle questions about the types of recreation and entertainment players enjoy, even their favorite music. The omnibus survey is often the first type of survey casinos conduct. After getting the general picture of their player base, clients may turn to more targeted surveys that are designed to look at one aspect of operations or one type of player in much greater detail. These are surveys that look at one part of your operation in detail. For example, a customer satisfaction survey of your hotel guests, or a survey dedicated entirely to food service. Often, target surveys are conducted when an area of operations is under-performing or when you are considering making major changes. For example, if you are thinking about changing a restaurant or opening a new restaurant, we might survey players to find out what they want and what they will pay. A target survey can also be used to address a single issue like customer service. In this case, the survey covers all areas of operation, but examines a single issue – service. Another way to use a target survey is to “target” one class of players, e.g., top players, poker players, players that travel a greater distance, players that live closer to a competitive casino, etc… any group that you want to understand in greater detail. These are short, quick, inexpensive online surveys – usually covering a single topic, and usually used to help casinos better understand some player behavior or to help decide a course of action. We’ve conducted snapshot surveys on media habits, promotions, rewards, points distribution, online gambling, and a number of other topics. Essentially, the snapshot survey is a condensed form of a target survey.